The only modern bird to equal this speed is the ostrich. By comparison, an athlete in a 200m sprint can reach a top speed of 12m/s (27mph). 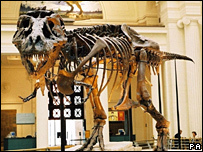 T. rex's speed is fractionally quicker than the average professional footballer. The work - by Drs Bill Sellers and Phil Manning - so far has focused on carnivorous dinosaurs. "One of the things that people argue about is why did they need to move as fast as they did - what are they chasing after?" said Dr Sellers. "We're now doing some work on Hadrosaurus which is assumed to be one of the things that T. rex would prey upon because there have been fossils found with bite marks on their backs. "What we find is that we're getting really quite high speeds for these animals as well, which makes perfect sense. If you're a fast predator, you're probably chasing fast prey that you want to catch." The model is the first to attempt to build a picture of how a dinosaur would move, without basing it on modern animal models. "There is no animation input; it's a fully dynamic model. We predict the movements of these animals but we don't base it on any existing animal movements. "The only input to the model is basically what we know from the fossil record about the shape of the animal," said Dr Sellers. "[The computer model] is much less biased by what we think about how these animals ought to have moved. We have this expectation that they ought to move like humans or ostriches, and of course they didn't. "They don't look very much like humans or ostriches, so they would have moved like dinosaurs; this seems to be a much better way of achieving that." There is one area where the researchers have had to make an educated guess, which is the muscle strength and density. "The muscles that don't fossilise we get from information from what we know about modern animals," Dr Sellers told the BBC News website. "It's all anatomical information that goes into the model and then the computer itself chooses the best way of activating the muscles in the model to maximise the speed of the animal." 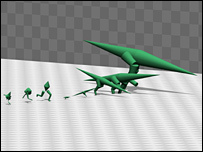 Using their dinosaur modelling techniques, the team also modelled humans and ostriches and compared the results with measured values. The group is confident in its approach. In the future, Dr Sellers and his team hope to produce 3D simulations of dinosaurs which will allow them to explore the full range of motions the reptiles were capable of. "At the moment, computers aren't quite big enough for all the things we want to do with the model. It takes a long time to get the animal to learn to walk. The next step is to move into 3D." They are currently working with animators on a dinosaur model which "because it uses the musculoskeletal model as the starting point, anything we get the animal to do, it could actually do".